Discover How You Can Rebrand Any Private Label Rights Ebook or Report With A Few Simple And Easy Tweaks, So That You Can Begin Running Your Profit Pulling Machine On Autopilot...Starting Today! In this specific video we will be talking how rebranding works and how it is vital to do this correctly to increase the profits of your private-label rights ebook or report. You’ll also be given an overview of the video series as a whole. Having an idea of how the video series works together as a whole will allow you to better understand how to implement this system so that you can begin rebranding your private rights ebooks and reports the right way. You’ll also be given a mind map to show you step-by-step how the whole system works in a little more detail. You’ll also learn what tools you can use to properly edit the products/graphics/sales page/squeeze page and much more. While most of the tools we will use are free, it is obvious that if the product has PSD files, then we will require Photoshop. We’ll show you super low cost ways to edit Photoshop files or how to get others to do it for you. In this specific video, you will be analyzing the private label rights ebook or report. Depending on what you have received, we’ll discuss how you can effectively rebrand the specific product into a new brand. For example, we will cover what things you should ideally receive in this type of product and how you go about producing those items you don’t receive. Also, before you can rebrand a product you need to understand your audience, and you need to understand why you are positioning it a certain way. In addition, other important things will be shown, like how to go about changing the title of the product, the subtitle, and how to effectively increase the perceived value of the existing product so it stands out. In this specific video we will talk about how you can rebrand your minisite and ecover graphics. In most private label rights ebooks and reports you will be given Photoshop files to be able to edit the graphics. Bear in mind though that Photoshop files (as you may know) require that you use the Photoshop program to effectively edit these designs. However, instead of paying hundreds of dollars to accomplish this, in this specific video I will show you how you can rent Photoshop on a monthly basis to keep your costs low if you choose to change the graphics (which we highly recommend that you do). You will learn how edit the Photoshop files, edit layers, resize images, change the title, the subtitle, replace images, and much much more. While there are some limitations (because you may not necessarily be a designer), in video four, you’ll be given a quick video on how you can outsource the graphics to a professional designer. If you don’t want to learn how to rebrand the the minisite graphics yourself, and want to save time, then you can always outsource this type of work to a professional designer. A professional designer will be able to create a design that might be closer to your liking and a more professional design. Outsourcing the minisite creation is actually very easy to do, however there are a few things that you will need to keep in mind, so we will actually cover all the aspects from step one to completion. You’ll learn where you can find these designers to design the mini-site that you like. In this specific video we’re going to be talking about how you can rebrand the sales letter; everything from changing the sales letter title, subtitle, and the introduction. We’ll also show you how to edit the actual sales letter (which you would normally receive in web HTML format). Fortunately we will be using a free HTML WYSIWYG tool, which is simply a tool that will allow you to edit the files. Now, don’t be afraid by the sound of HTML, because if you understand how to edit a Microsoft Word document or any type of word document then using this specific tool will be just as easy. In this specific video we will be discussing how you can rebrand the actual product, from start to finish. For example: how to rebrand the header, the footer, the graphics, the author name, your website, title, subtitle, chapter headings, table of contents, fonts, images and much much more. Now don’t worry, if this sounds complicated then rest assured that it really is not, if you have done the proper planning in video two. The actual implementation of rebranding the product will be much easier.. This specific video will be quite straightforward. You will learn how to convert a rebranded word document into a PDF file. It will be wise to convert it to a PDF file; this way anyone who does not have a program that can read Microsoft Word .doc files can read the final rebranded product. You won’t want to leave out potential customers. In the specific video, you will learn how to customize your squeeze page. Everything from start to finish is shown, for example how to edit the graphics, implementation of your auto responder HTML sign-up form, how to set up your thank you page, and your main sales letter page. In this specific video you will learn how to take the existing follow-up messages and insert them into your auto responder HTML e-mail system. The purpose of your follow-up messages depends on your end goal. You could either be preselling your product or you could be using it to build a stronger relationship with your list. If however you do not have follow-up messages, you will be shown a quick and easy method to writing your follow-up messages. In this specific video, you will learn how to set up your thank you page, showing everything from start to finish. The thank you page allows you to deliver your private label rights e-books or report product so your customers can download it onto their computers. You will learn in full how to create a thank you page, all the way to connecting your downloadable product to your thank you page. Now it is time to set up your automated payment deliveries. To keep things simple we will be using the PayPal payment processor. You’ll learn how to connect the main sales letter to the PayPal payment button on your main sales page, which will lead to your thank you page. 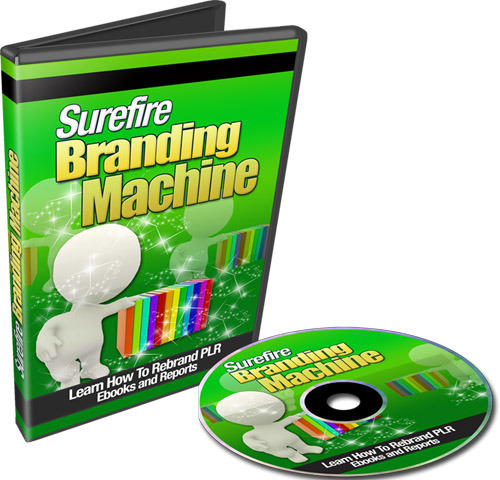 Surefire Branding Machine (with Resell Rights) surefire branding machine 242333497 30.97 resellrightsvideos Fresh Download Available!